At first I did not understand what it meant; I did not know that I was not just playing for myself but for all the men that have ever worn the “G”. I tell the guys everyday that what we do here reflects on the whole program. 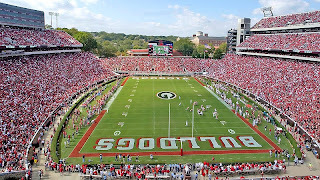 Georgia football is bigger than any one player on the team. I asked some of my teams this same question, “what does it mean to wear the ‘G’?” Rod Battle said “playing for the ‘G’ is like competing for the United States in the Olympics. It’s my home state, a place where I’ll be forever connected to. Plus I have all the extended family members I have grown to love here." He goes on to talk about what playing for the "G" has meant to him personally. But to cut and paste that would be to spoil it. Hell yeah Jeff. Hell yeah. we are gonna have one swarming junkyard dawg defense next yr with Jeff leading the way. I bookmarked Jeff's blog. Besides being a down and dirty dgd he seems to be a level headed guy that truly appreciates where he is. It's always a pleasure reading about him, with the tough situation he was in last year, and his decision to stick around. While it's obvious (and fair) to say that it had partly to do with money, it's pieces like this that affirm he is here because he wants to be. Goals National Championship, All American and outland trouphy. I like your style big man. D coming back with a vengenace next year. This squad will be the return of junkyard dawgs. No more pretty boys (on either side of the ball). Hell, bears are afraid of Jeff Owens, too. bears ditiness? To paraphrase "Anchorman"
Someone should make a cologne with real bits of Jeff Owens, so you'll know it's good. Every incoming recruit should be given this with their playbooks. Outstanding! Even Chuck Norris is afraid of Jeff Owens. 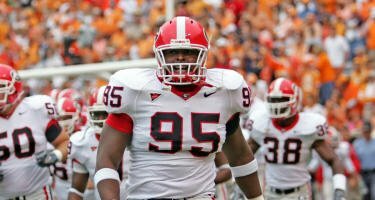 Speaking of Damn Good Dawgs, how 'bout some love for Kiante Tripp -- who will switch positions yet again this season, heading back to his favorite place at DE (where our depth chart is about a quart low). That's some fierce loyalty, too. I'm likin' the HEART of this year's squad!! Anon 3:20 is dead-on: I'd give this to every freshman (hell, maybe every recruit) and encourage them to think about what it means to them. All the people who are cynical about college football, and don't think it means anything to the players beyond impressing NFL scouts, ought to have a look at this too. It reminds me of what Joe Cox supposedly said when he took over the QB job at the end of the Colorado game, something like "If we can't score two times, we don't deserve to wear G's on our helmet." One of my favorite quotes. Between those two guys and the energy and heart from a lot of our players (Curran always springs to mind), I may be more excited about this year than last. These guys want it, and not to say the team didn't want it last year, but I think these guys are going to get it. Very glad Jeff is back. Wish it had been under better circumstances, of course, but maybe there's a reason for everything. That kind of leadership is a breath of fresh air. Gee...do you think we missed his leadership just a little bit last year? Sorry guys. I just saw that one. There are nuts that post 10,000-80,000 word cultish psycho nut job stuff on random blogs constantly. That person hits my site about once every 4-6 months. Just ignore it. And email me the link / heads up. I'll be along to delete it soon enough. Although, I did think the Tebow related responses were funny. Dangit! Imissed it! What did the lunatic say about teblow? The nut didn't say anything about Tebow. A commenter thanked Tebow for posting.